TPO roofing is great for anyone looking for an inexpensive, energy efficient roofing solution. With a highly reflective surface, TPO roofing in Dallas, TX provides fantastic weather protection and energy efficiency for commercial customers with flat roofs. Whether you’re replacing or looking for a roofing choice for your brand new commercial building, we can help you with your TPO roofing installation. Call 214-321-3293 to get great, low-cost TPO Roofing installed for your business today! TPO roofing is great for restaurants and high volume commercial businesses. TPO roofing offers numerous possibilities for business roofing in hot or stormy climates like Dallas, TX. As an environmentally friendly material, it not only saves you money during initial installation but also further down the line! For the best results have a professional from Legends Roofing install this great roofing material for you. With safety first, we’ll make sure you get the best out of your new roof while staying safe and protected. Once fully adhered, the heat welding process will create a perfect waterproof rooftop that can last for many years. Not only is it naturally impervious, but it also is extremely puncture resistant – this means that even in the worst hail storms you’ll suffer minimal damage. This is just one more way business owners can save money with this fantastic commercial roofing choice. It’s highly reflective, so businesses from the hot and humid area can benefit from lower energy bills while a TPO roof is installed. 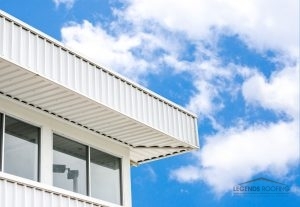 The light-colored, shiny membrane will redirect sunlight while allowing your building to better regulate indoor temperatures during the long, hot and humid summers. In the winter time, you can look forward to less ice and snow build-up on the roof as well as a warm, cozy workplace in doors. This cuts down on air conditioning and leakages as well. In comparison to other flat roofing options, TPO roofing is much more eco-friendly and a little more cost effective. Unlike many other roofing options, TPO roofing doesn’t have any chlorine in it, which is often harmful to air. With this roofing type, you’ll use your heating and cooling system less and in turn, put out less air pollution from energy use. Contact Legends Roofing Contractors today to install TPO roofing in Dallas, TX on all of your commercial buildings. With our help, you can look forward to saving money and less headaches with a brand new roof over your head. Experience low energy bills and less frequent roof maintenance with our storm resistant TPO roofing installation. Call 214-321-3293 now for all the information you’ll need to move forward. Updated on August 4, 2017 at 3:05 pm by Legends Roofing.